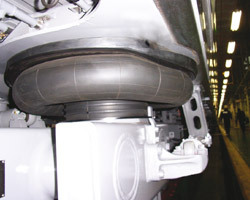 Bridgestone Air Springs: High quality and safe anti-vibration suspension systems for a wide range of railcar vehicle undercarriages, including high-speed and intercity trains, metros and trams. Part of the secondary suspension system, Air Springs play an important role in isolating the vibrations which naturally translate from the rail through the steel components of the undercarriage. High quality Air Springs provide damping by controlling both vertical and lateral movement. This brings comfort and stability to the passenger and also helps to reduce noise. For further information contact your local Bridgestone Industrial Sales Office.